It’s the day after my social media fast. What you are reading is the culmination of these three days. I decided to not post nay blogs for the past few day because fasting social media would prevent me from posting them, so I decided to wait. Our church is doing a three day fast on the first Monday of the month through Wednesday. We’ll be gathering for an hour before service on Wednesday to pray and break fast together. 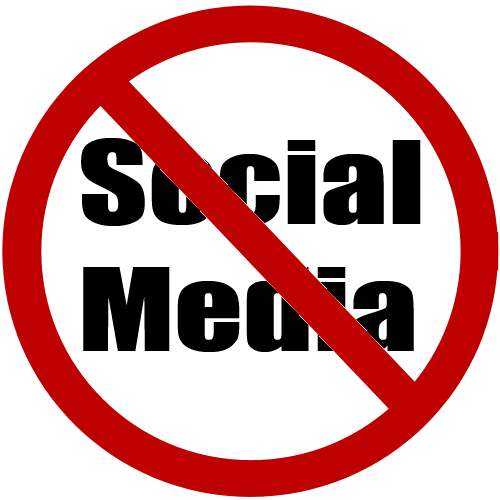 I decided Sunday night to commit to fasting social media because to me, social media has become “food and drink” for the soul”. For me, giving up being connected through Twitter and Facebook is more of a sacrifice than giving up food. What I’ll miss most is posting those bits of information, articles, and videos that I think will benefit my followers and fellow youth workers. Last year I gave up television for 21 day, but I think this will be a little harder. We’ll see. I’ll keep you posted. You just won’t be able to read my thoughts until my fast is over. Challenge: Tried to contact an author and could not find an e-mail for them. Did not use Linked In because I consider it Social Media. Can’t connect until today. Refection: Confused at what to do with all those thougthts I can’t post or tweet. My first day of the social media fast felt different. It felt like I was skipping food. I would get social media hunger pangs because I would have a though and I did not know what to with it. In today’s age, when I have a thought or an idea, I post it and spread it, it’s weird not to do that. I have put an imaginary jar on my desk to put those thoughts and save them for later, but I think I am going to need a bigger jar. My mind was less cluttered and some God thoughts were able to walk right into my formerly thought-hoarded brain. 1. Could not complain to everyone about why Money Pak costs $4.95 so I can put money in my Pay Pal account. 2. I wanted to share a few thoughts to inspire others, forced to ponder them instead. 3. I found several resources I wanted to tweet but I had to hold on to them until after 6:00 p.m. today. This brings up an interesting question, if you are one of my followers, did you miss any of this? I am not asking for a self esteem boost, but rathe to put my own existence in perspective. Sociology is the study of who we are in light of our interactions with others; and since I have limited these interactions, have I descended into an identity crisis? No, I haven’t. In fact, I think I know myself better because I have not relied upon someone’s RT, like, or share to validate me. My identity, my true identity, is in Christ alone and nothing will change that, ever. Will I being doing less social media now in light of this discovery? No, in fact, I will be doing more. This confidence has nothing to do with hubris, but it is has challenged me to be more respectful of those who follow me and those I follow. Three days is a long time in social media time. You can be forgotten quickly as people move on to what ever is new. If this fast has taught me anything, it is that I am o.k. with that. Beside, social media is a great place to launch a comeback because of the time you have had to think about what is really worth sharing. Just saw this on Morning Joe. Glad I am not alone. Killing me that I cannot share this right now. Here a few tips I offer if you want to do your own social media fast. Have you done a social media fast? What did you learn? Would you do a social media fast? Why or why not?